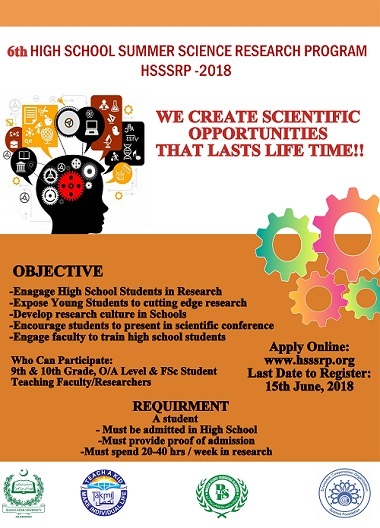 The 6th High School Summer Science Research Program (HSSSRP-2018) Contest is jointly organized by Quaid-i-Azam University Islamabad, ECO Science Foundation (ECOSF), Pakistan Science Foundation (PSF) and Takmil Foundation. The registration for 6th High School Summer Science Research Program (HSSSRP-2018) Contest is open. The students of 9th & 10th Grade, O/A Level, F.Sc students can participate in the contest. Teaching faculty/Researchers can attend the program. Engage High School Students in Research. Expose Young Students to cutting edge research. Develop research culture in Schools. Encourage students to present in scientific conference. Engage faculty to train high school students. Last Date for Registration: June 15, 2018.